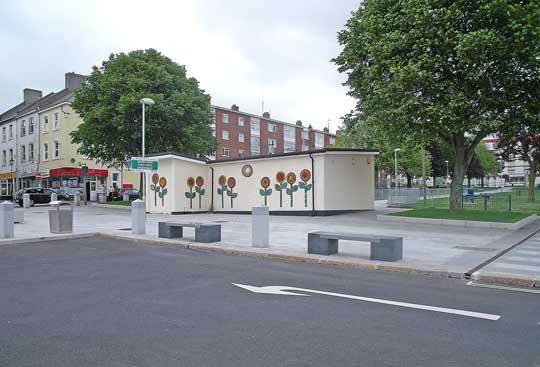 Ever since WWII ended Granby Green has been considered a key public open space. 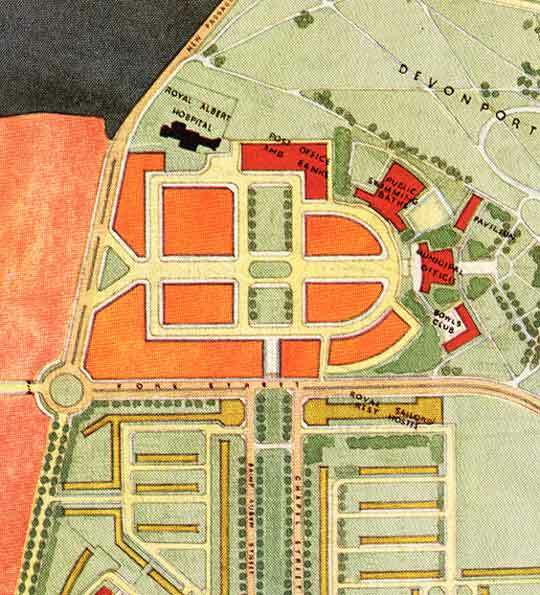 In the original Plan for Plymouth of 1943 the Green was to be the focal point of Devonport, with new civic structures and traffic routes designed around it. But those plans never came to fruition and the Green quickly became a plain open plot of land, idly sitting there with no particular function, not even as a beauty spot. During the 1950s and 60s the Green remained rather ugly, lacking even a formal layout of trees. From the 1960s onwards attempts were made to 'green' the Green, as it were, with trees and shrubs, thus for the last couple of decades of the 20th century it did actually look like a Green - which at least made sense visually, not only for residents to live in the area, but also because main bus routes bordered the Green, and the view was open to passers-by. 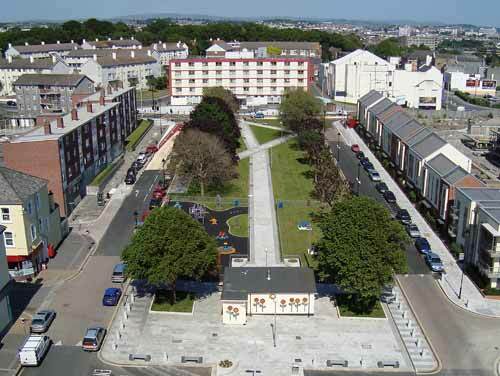 When Devonport received Regeneration funding from the Government's 2001 NDC (New Deals for Communities) project, plans were put in place, and funding raised, to upgrade the Green in line with the regeneration that was taking place all around. This section reproduces part of the... 'MINUTES of the DRC Partnership Board Meeting, 17th April 2008'. The project is intended to produce an enhancement of this key public open space. Its purpose is to lift the feel of the area’s environment, project an attractive image of an area reinvigorated, by welcoming visitors, existing and new residents, encouraging pedestrian movement across it and social activity within it. By undertaking the proposed environmental and transport infrastructure works it is intended to ensure that the vitality and viability of neighbouring developments is properly safeguarded. Confirmation that Redrow are carrying the full costs of traffic build outs to south side of Green before funds are released Confirmation that all future maintenance costs are properly in place for all aspects of the project to be received before funds are released. Especially for public art, toilets, playground & beds and trees. In October of 2008 local newspapers announced a consultation event at the Brickfields Sports Centre, whereby residents could examine the plans for the Green and put forward their views and suggestions. The headline of the article was Piazza Plan to Transform Tired Green. 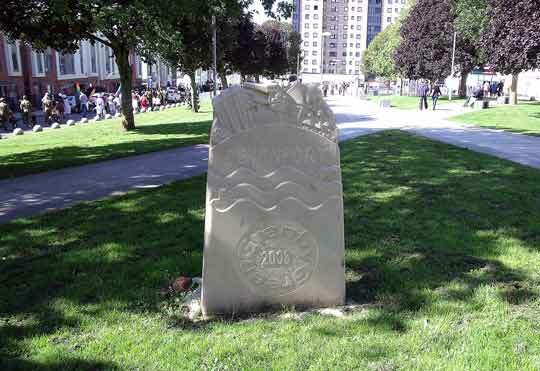 “We are creating a piazza to reinforce the link between the Vision site (the former Royal Navy stores enclave) and Marlborough Street, to create a focus,” said Plymouth City Council’s senior project manager Patrick Bowes. “We are giving it a structure so you are actually encouraged to walk through it, and to sit there at lunch time. A fenced-in park, with a children’s play area and new pathways, is part of the plans to transform what is now just a patch of grass with a boiler room stuck on one end. The council aims to transform this “rather tired and bland green space into somewhere where children can play and people will stop and enjoy their surroundings”. 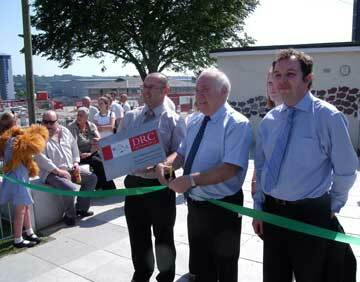 The upgrade to Granby Green was officially opened on 24 June 2009. The refurbishment included a new playground area, attractive granite paving, new street lighting, seats and picnic tables. 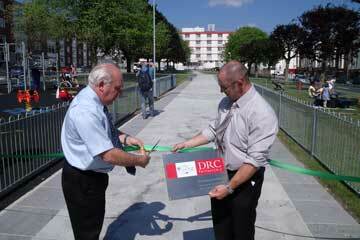 The reopening was carried out by local business-man Will Blagdon and Councillor Michael Leaves. The car park at the bottom of Granby Green was upgraded at the same time, with new bollards and planting. 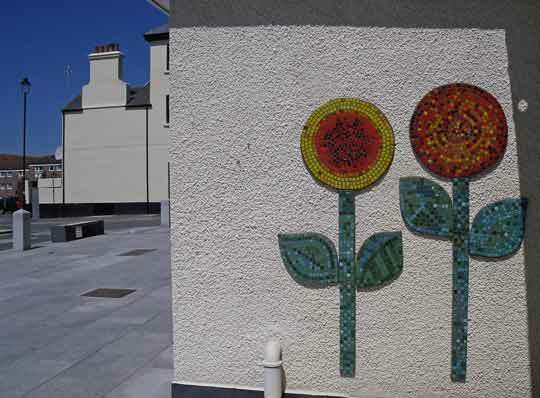 The old toilet block was not able to be removed as it had recently been converted to a boiler room for Marlborough House, but it was brightly repainted and covered with artwork. Speed ramps were installed on the roads either side of the green, with new crossings for pedestrians, and the nearby traffic light system was upgraded at the same time. 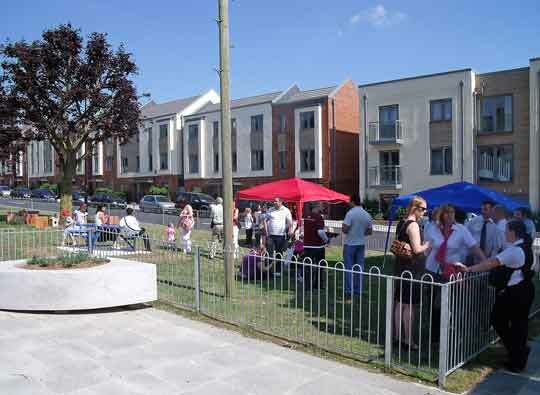 On completion, as a linking green space between historic Marlborough Street and the new build taking place in South Yard, Granby Green is now so much more attractive. 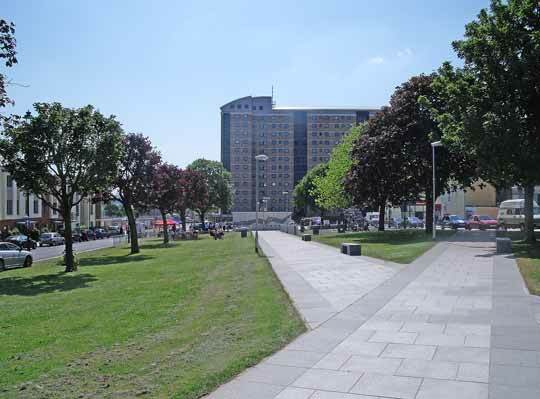 The scheme was managed by Plymouth City Council, at an eventual total of £745,000, with a £400,000 investment by the Devonport Community Regeneration Partnership, £260,000 from developer Redrow and £85,000 from the Local Transport Plan. Previously a public lavatory, the building now houses a boiler for Marlborough House. 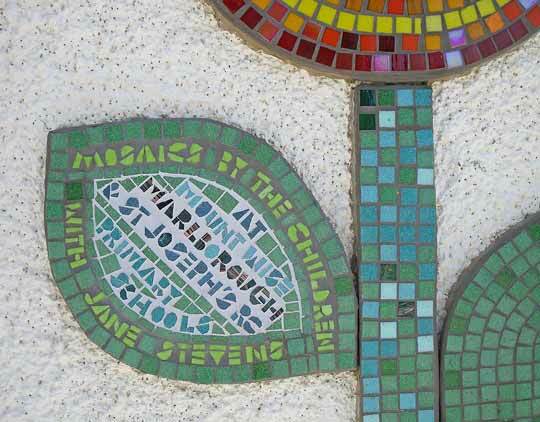 The mosaics were compiled by local schoolchildren with the help of artist Jane Stevens. 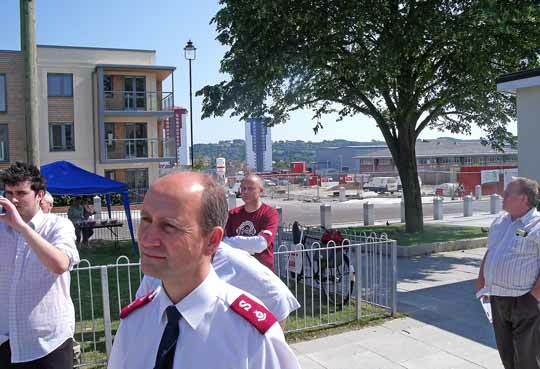 Attending the opening event, recognised by his red epaulettes, stands a representative of the Salvation Army (which overlooks the Green from the top/eastern end). 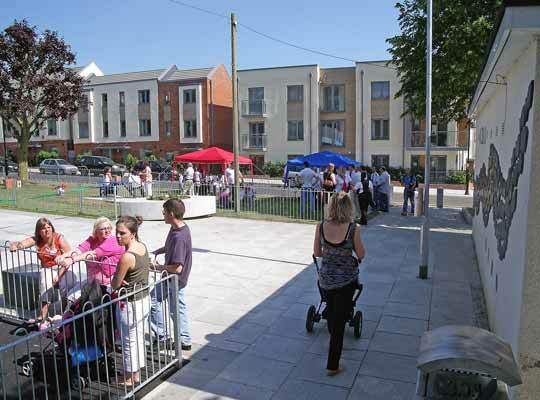 In this 2009 photo the Extra Care home, which today stands next to the flats seen behind, had not yet been built. Will Blagdon at left and Councillor Leaves in the centre. June 2009. Councillor Leaves and Will Blagdon from a different angle. June 2009. Anti-parking bollards were installed at Granby Green during Spring 2010.